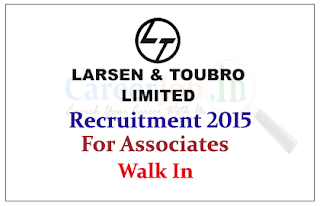 L&T Limited is recruiting for the post of Associate Operations-Accounts. Eligible candidate can attend the walk in Interview on 6th to 8th July 2015. Company Profile: Larsen & Toubro Limited, also known as L&T, is an Indian multinational conglomerate headquartered in Mumbai, Maharashtra, India. It was founded by Danish engineers taking refuge in India, as well as an Indian financing partner. The company has business interests in engineering, construction, manufacturing goods, information technology, and financial services, and also has an office in the Middle East and other parts of Asia. How to Apply: Interested and eligible candidate can attend the walk in Interview on 06.07.2015 to 08.07.2015. For more details kindly check official notification.